In the days before environmental concerns become popular, it would not be unusual to see large puffs of black smoke rising from buildings in the city from incinerators in apartment buildings. Nowadays such flagrant air polluting is pretty rare in the city, thanks, no doubt, to the wonders of recycling. Smaller puffs of grey smoke, however, are sometimes discernible from chimneys in buildings with wood-burning fireplaces, perhaps the most desirable apartment amenity. In some cases, roofs may have a large chimney or two with multiple flues. In others, there are individual mini-chimneys, often with domed caps. While the city has no equal to the great French Renaissance chimneys of the royal Chateau de Chambord in France, it does have a couple that are notable. Perhaps the most impressive sits atop the great Crown Building erected by August Heckscher and designed by Warren & Wetmore in 1921 on the southwest corner of Fifth Avenue and 57th Street. 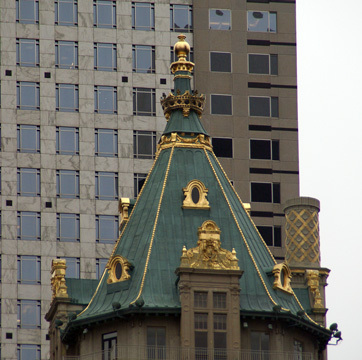 Its cylindrical shape is gilded and very ornamental and it is all the more interesting because it is not atop the office building's great pyramidal roof, fitted with numerous oculi, but at the southwest base of the pyramidal roof. A more visible chimney is at the pinnacle of the Carlyle Hotel on the northeast corner of Madison Avenue at 76th Street. 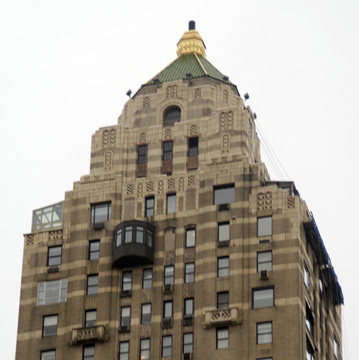 The chimney, shown above from the northwest, is a little unusual in that its relatively thin, black "pipe" extends upwards, almost half-heartedly and sneakily, just a bit from the very prominent gilded "bump" on the building's crown. One of the city's great skyline buildings even though it has been dwarfed by some nearby towers, the 37-story Hampshire House at 150 Central Park South is noted for its spectacular, steeply-pitched copper roof with two tall chimneys that harkened to those atop the Savoy Plaza Hotel that formerly occupied the site of the current General Motors Building on Fifth Avenue. At 123 West 15th Street, Colin and Pamela Rath are planning a residential mid-block building that has numerous "dancing" chimneys on its bulbous roof. Even humble chimneys are a comforting sign that some people in the city can be warmed by a stoked hearth, an image perhaps not as merry as Santa Claus but very cheery nonetheless.